Taking notes is important but protecting them until the presentation or test is a must. 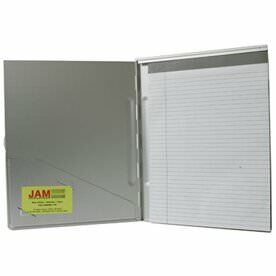 With our Aluminum Pad Holders, your notes will be safe and sound from any bending or tearing. Spilled coffee all over your desk? It's totally fine! Your notes will be safe. Dropped the pad in the hallway? Still totally fine! Our aluminum covers are basically indestructible and are great shields to those office woes. Our standard Aluminum Pad Holder is perfect for note taking. 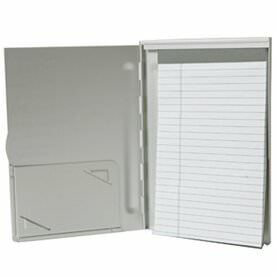 With its side pocket, you'll be able to keep all of your notes in place while putting your hand outs in the pocket. 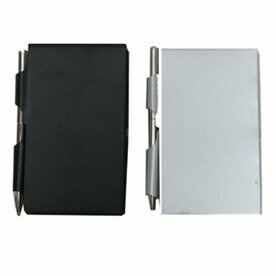 Try our Aluminum Pad with Pen if you always lose your pens. This way, you'll have it attached right to the pad so you'll never lose it again. Or go for our Aluminum Pad with No Pen if that isn't a problem. 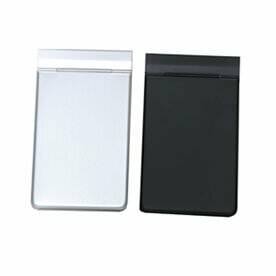 Go for our very futuristic silver or try our black aluminum for a very professional edge. Want to go for a more natural look? Try our Kraft Pad Holder with Button & String. Everyone will be asking where you got such a thing, since it's so unique. When you want your notes to stay in place but look good at the same time, these pad holders are certainly for you so start shopping now!